The Lectrosonics 400 Series wireless microphone systems combine digital hybrid technology, diversity reception and rugged components to achieve pristine audio signal at long range. The Lectrosonics UCR401 is a compact, portable camera mountable receiver designed for professional audio applications in the field or in-doors. The receiver is completely compatible with all 400 series wireless transmitters and provides 256 selectable UHF frequencies across a 25.6 MHz tuning range. Smart Diversity reception reduces RF interference and drop out and a built-in RF spectrum analyzer searches across the entire 25.6 MHz tuning range, locating the strongest possible frequencies in the area. The clear frequencies are marked and displayed on the back-lit LCD. Balanced XLR output provides maximum output gain with minimal noise and the receiver is powered with internal 9V batteries or external DC power supply. 24-bit digital audio stream is decoded at the receiver resulting in greater operating range without noise and artifacts caused by analog compandor circuits. The UCR401 features a compact, lightweight design for enhanced comfort while mounted onto cameras. The comprehensive LCD provides all necessary parameter information as well as a frequency spectrum analyzer for locating ideal operating frequencies. The UCR401 is powered with two AA alkaline or lithium batteries. The receiver will operate up to 11 hours on lithium, 4 hours (continuous) with alkaline batteries. 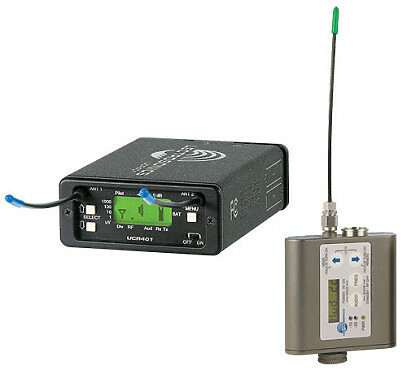 Both transmitter and receiver offer 256 selectable UHF frequencies over a 25.6 MHz range. A compact, portable camera mountable receiver. Provides 256 selectable UHF frequencies across a 25.6MHz tuning range.